The bluefish (Pomatomus saltatrix) is the only extant species of the family Pomatomidae. It is a marine pelagic fish found around the world in temperate and subtropical waters, except for the northern Pacific Ocean. 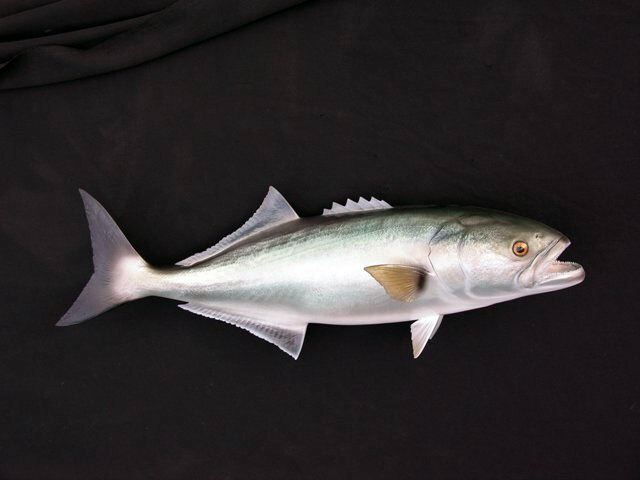 Bluefish are known as tailor in Australia, shad on the east coast of South Africa, elf on the west coast. Other common names are blue, chopper, and anchoa. It is good eating and a popular gamefish. The bluefish is a moderately proportioned fish, with a broad, forked tail. The spiny first dorsal fin is normally folded back in a groove, as are its pectoral fins. Coloration is a grayish blue-green dorsally, fading to white on the lower sides and belly. Its single row of teeth in each jaw are uniform in size, knife-edged, and sharp. Bluefish commonly range in size from seven-inch (18-cm) “snappers” to much larger, sometimes weighing as much as 40 pounds (18 kg), though fish heavier than 20 pounds (9 kg) are exceptional.